Stand and touch wall or stationary object for balance. Grasp forefoot behind. Pull forefoot to lower back. Hold stretch. Repeat with opposite side. 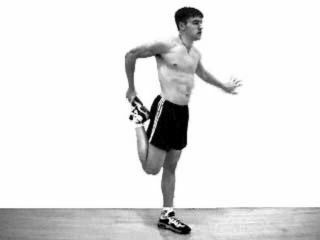 See Standing Quadriceps Stretch for similar exercise which can be combined with this stretch and performed simultaneously.